A call to Hanneke Maljaars at Oceanstyle brings confirmation that their joint listing with Burgess, Cantieri di Pisa's 41m motor yacht Blink, has had her price changed from dollars to Euros, along with a substantial reduction. Blink was built in 2009. 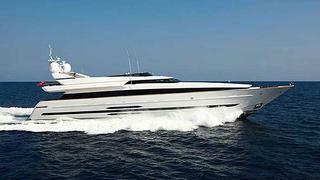 Still under full warranty, she is one of the largest fly bridge yachts available on the market today. Built in composite and ABS classed she combines Italian style, flair and feeling with very high standards of construction, engineering and performance. Her exterior styling is by Carlo Galeazzi and interior design by Cristiano Gatto. This superyacht accommodates up to 11 guests in 5 staterooms, plus 3 extra Pullmans. Her main deck and sundeck are wheelchair friendly, including an elevator and dedicated cabin. Blink is one of the finalists at the 2010 World Superyacht Awards and is now asking €14.75 million.